Sustaining Vision: The Dr. Luther W. Brady H’88 Collection at the Picker Art Gallery, open from January 24–March 10, 2019. For nearly four decades, gifts of artwork from the late Dr. Luther Brady have greatly enhanced the collection of th Picker Art Gallery and have become invaluable resources for teaching and learning with art at Colgate. As Colgate celebrates its Bicentennial, Sustaining Vision presents two dozen artworks that tell the story of how Brady’s attitude toward artists, arts patronage, and acquisition helped to shape the museum’s collection. Works by leading figures of abstract expressionism and other postwar art movements, such as Richard Diebenkorn, Barbara Hepworth, Jasper Johns, Robert Motherwell, and Fritz Scholder, are included in the exhibition, along with examples by several Philadelphia-based artists, many of whom, like the Picker, found an avid and active patron in Dr. Brady. The exhibition is partially funded by the Dr. Luther Brady Endowment for Art Maintenance, the Robert J. Gerberg '59, P'85 Endowment for the Visual Arts, and by the Friends of the Picker Art Gallery. 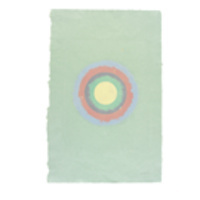 Image: Kenneth Noland Circle II, I-2, from the Handmade Paper Project, 1978, colored, pressed paper pulp; monoprint, Gift of Dr. Luther W. Brady H'88, The Luther W. Brady Collection of 20th-Century Works on Paper, 1992.76. © 2019 The Kenneth Noland Foundation/Licensed by VAGA at Artists Rights Society (ARS), NY.